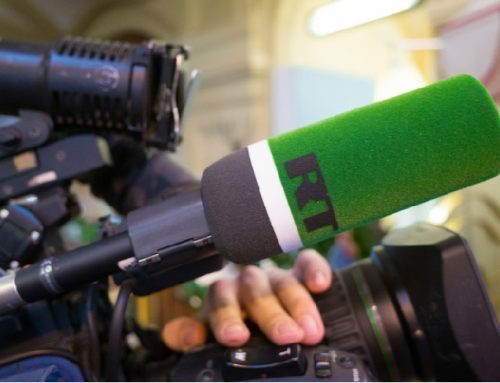 On May 24, an international team of investigators from the Netherlands, Australia, Malaysia, and Ukraine announced that a Russian anti-aircraft missile was directly responsible for the downing of Malaysian Airlines Flight 17 (MH17). The following day, Australia and the Netherlands officially declared that they held the Russian government responsible for the downing. Concurrently, Bellingcat, McClatchy DC Bureau, and the Insider released a joint report revealing a Russian military intelligence commander as a key person of interest in the investigation. 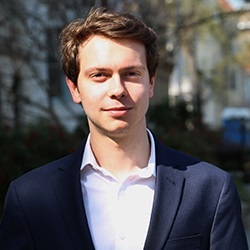 Initial analysis of social media reactions to these announcements indicated that Kremlin outlets were struggling to effectively counter the new evidence implicating Moscow in the downing of MG17. 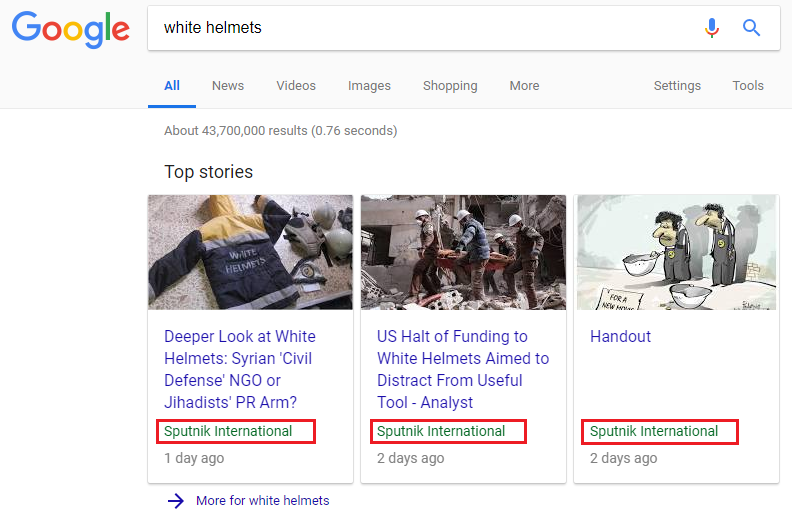 However, over the next week, conspiracy theories and disinformation narratives from Russian propaganda outlets found a foothold on an impactful and unlikely medium: Google’s front page. 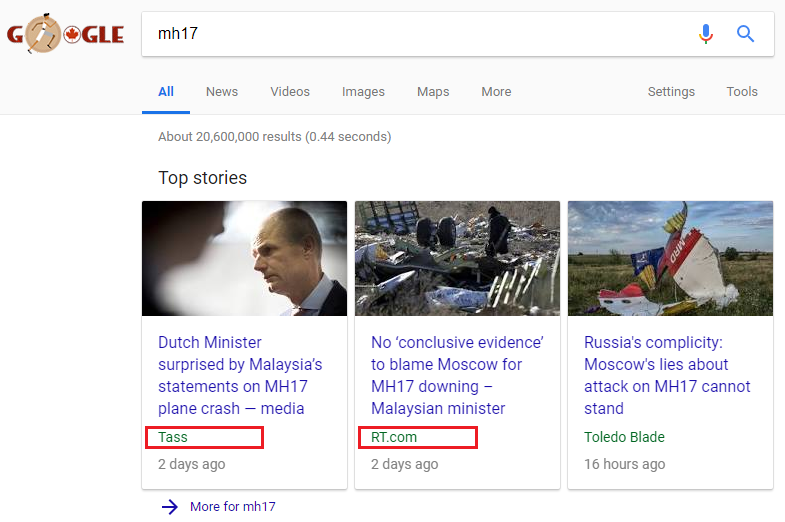 In the weeks following the new announcements surrounding the MH17 investigation, articles from Russian state-controlled news outlets RT, TASS, and Sputnik regularly appeared on the front page of English-language Google searches for “MH17” through the site’s Top Stories function. 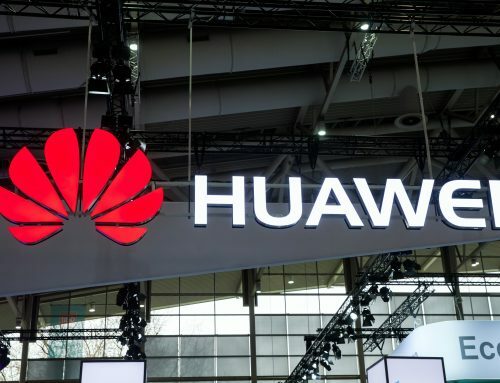 Searches run through various VPNs and Google’s incognito mode reveal that the pattern is not limited to a particular English-speaking community or locale. 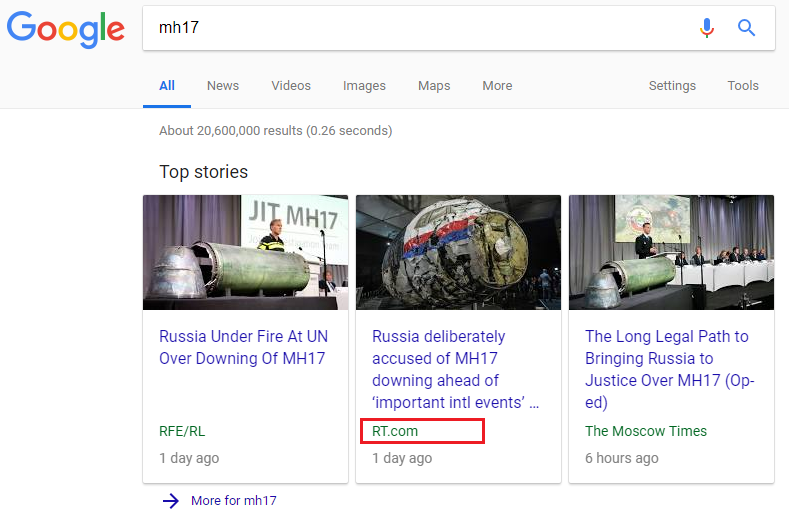 Additionally, searches for “MH17” through a Berlin-based VPN exposed similar results from RT and Sputnik’s German-language affiliates. 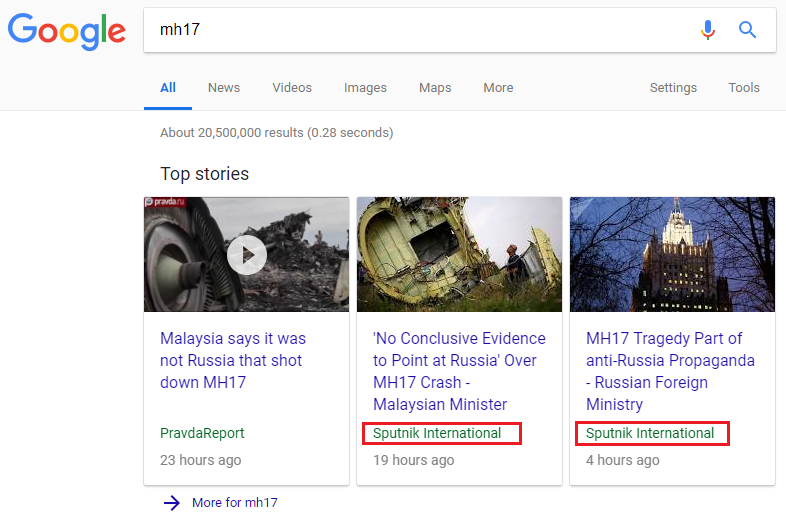 The articles published by these sites present an alternative reality to the downing of MH17, often discrediting existing evidence, pushing false narratives, and creating conspiracy theories to undermine readers’ understanding of events. 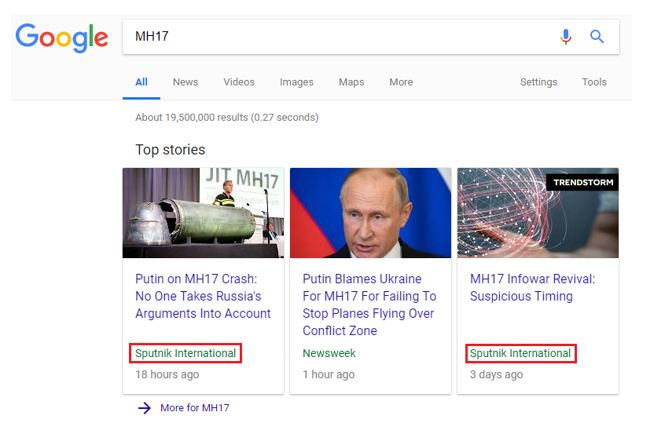 Unfortunately, the prevalence of Kremlin propaganda in Google’s Top Stories is a relatively consistent pattern. 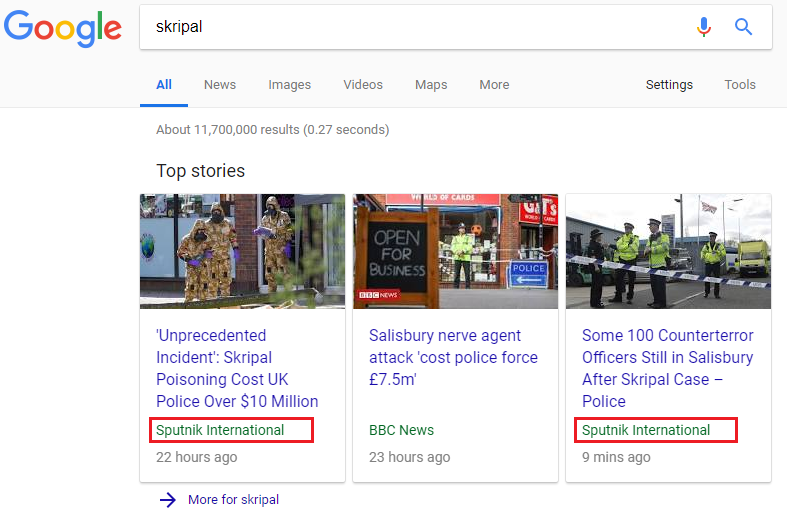 In the days and weeks following several other international events, including the poisoning of Sergei and Yuliya Skripal, Russian propaganda similarly haunted Google’s front page. These articles steer consumers to a more Kremlin-friendly narrative of the poisoning, often through denials of evidence and distracting conspiracy theories. 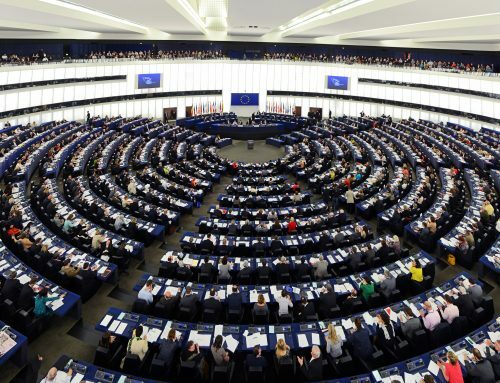 More recently, Kremlin outlets have seized on an emerging issue in the form of the Nord Stream 2 pipeline, a political project for Moscow that threatens to significantly undermine European unity and expand Russian influence over the continent. 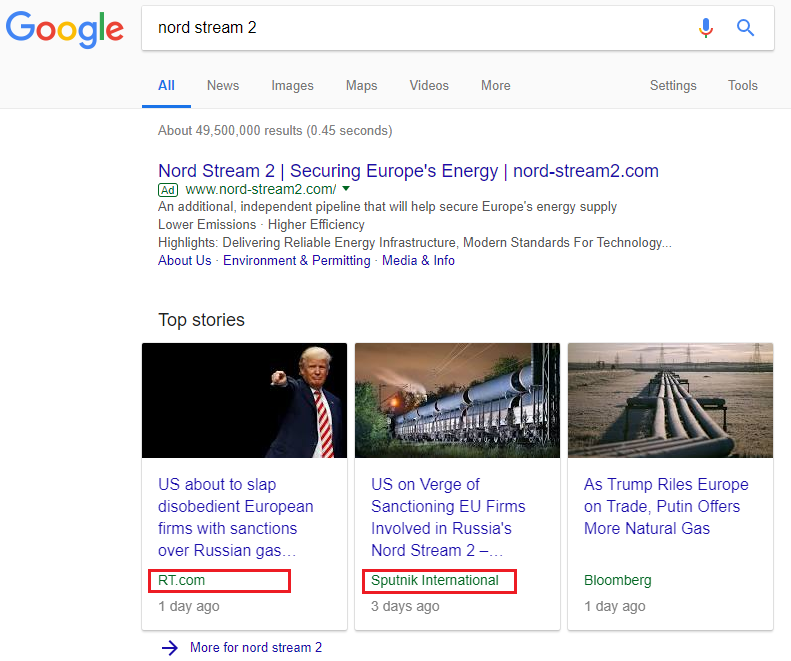 As with MH17, Skripal, and Douma, Kremlin narratives of Nord Stream 2 often feature prominently on Google’s front page. 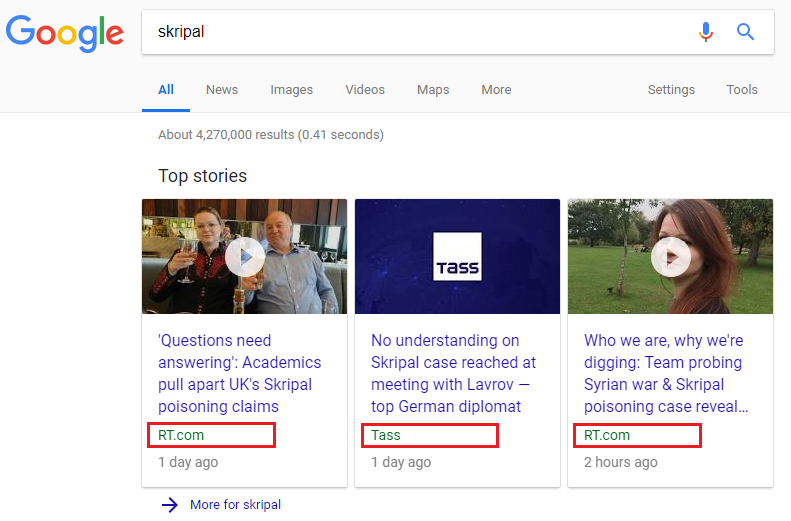 Although it is undeniably harmful for public perceptions, it is unclear why Google’s Top Stories function regularly showcases Kremlin propaganda. 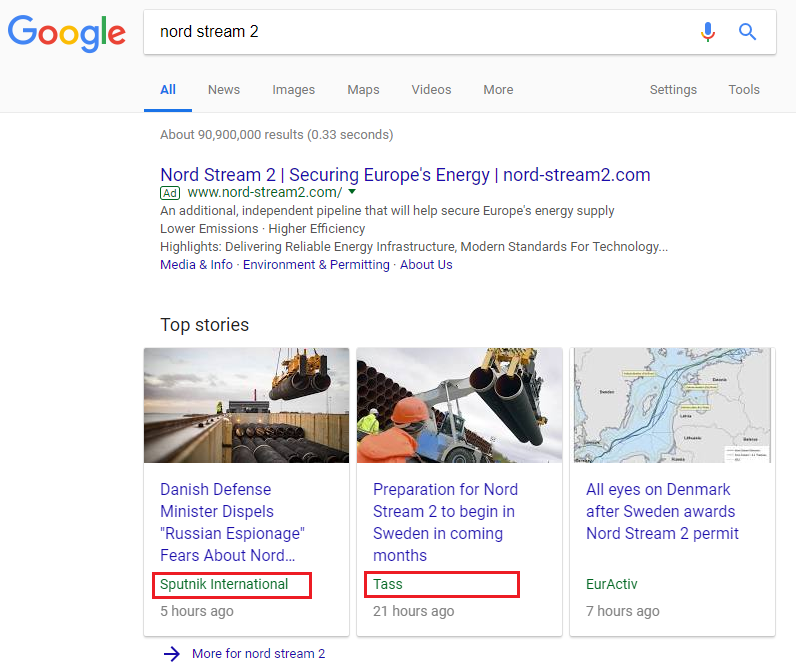 According to an employee on the site’s forum, the Top Stories are not a feature of Google News, but rather are automatically drawn from Google’s general search function. 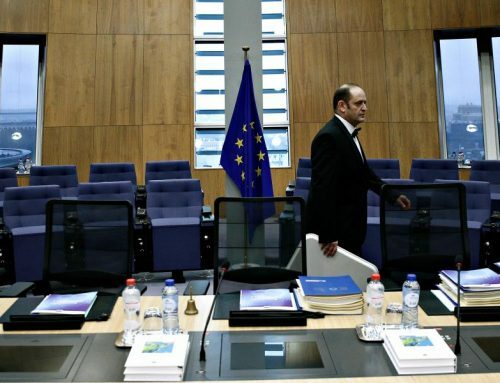 While Google has taken significant steps to counter disinformation in recent months, most of these measures have focused on Google News, and it is not clear if any of these policies will impact the Top Stories feature. 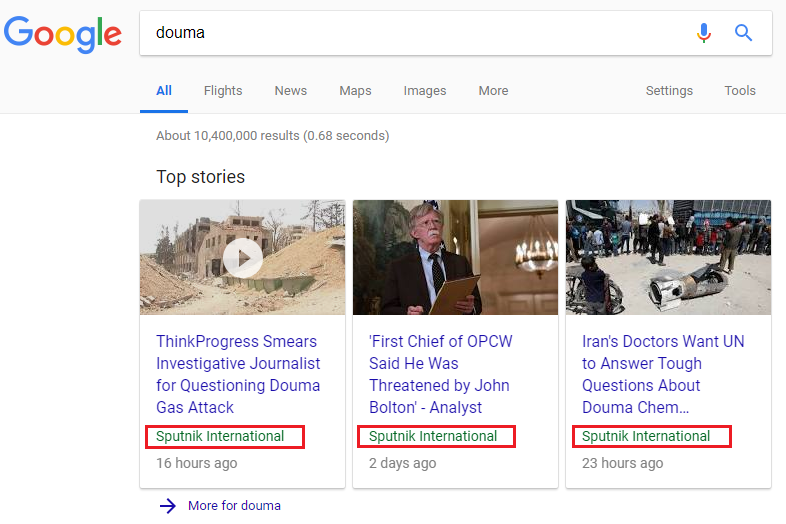 The continued dominance of Russian propaganda in Google’s Top Stories creates a dangerous vulnerability for misinformation surrounding important political events. Internet users trust Google to provide authoritative and accurate content on the things that they search. 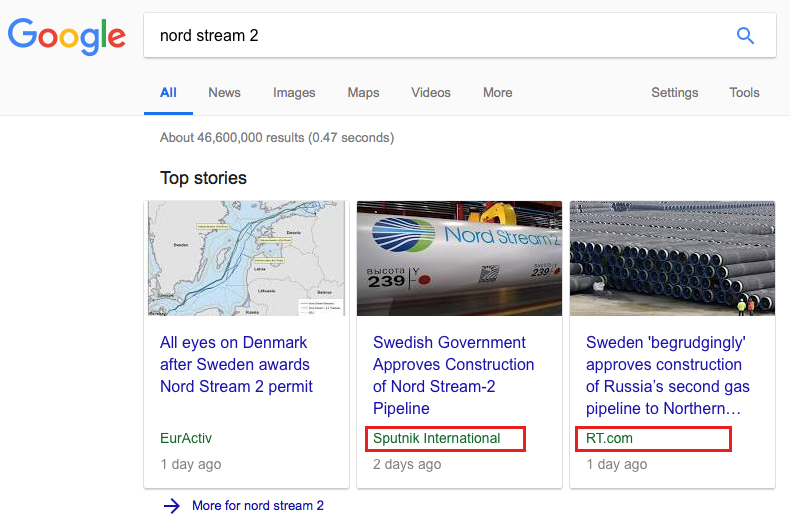 As described by Vice President of Google News, Richard Gingras, the role of Google Search is to provide users with “the tools and information they need… to develop their own critical thinking and hopefully form a more informed opinion.” However, in its current form, the Top Stories function often does the opposite. Rather than empowering visitors with various evidence-based, trustworthy perspectives, the feature often promotes intentionally misleading, state-controlled propaganda. These articles do not inform users, promote critical thinking, or encourage nuanced public discussion. 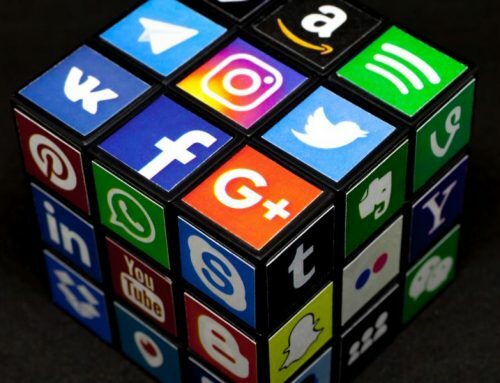 Instead, they turn the most popular site in the world into a mouthpiece for an autocratic regime intent on covering up human rights abuses and international crimes with conspiracy theories and disinformation.